This is the best Bolognese Sauce you'll ever put in your mouth! Don't miss out, click below to grab this recipe! * Optional top with shredded Parmesan or Italian Cheese blend. Add EVOO to deep skillet and set to medium high heat. Add Onion, Garlic Cloves, Carrots, and Celery to food processor / blender. Pulse until finely chopped. Add to hot skillet and stir. Cover and cook for 4 to 5 minutes or until vegetables are tender stirring frequently. Next make a well in the vegetables and add Tomato Paste and stir until well combined. Add Crushed Tomatoes and mix until well combined. Add Tomato Sauce and stir well. Next add Sweet Italian Sausage, Ground Beef, Garlic salt, Salt and Pepper. Mash meat to break up and combine, stir frequently while browning. Cover and simmer until meat is fully cooked. Add Oregano, Basil and Parsley stir well. Add Milk stir well, cover and reduce to medium heat. Add water and salt in Pasta pan and bring to a boil. Add Red Wine Vinegar to sauce, stir well and cover. Add Pasta to boiling water and cook as directed on package. Once Pasta is at desired tenderness, plate Pasta, smother with Bolognese, top with cheese if desired and enjoy. this dish screams to be called something better than soup! 1 32 - 48 oz of Chicken broth (depending on thickness) 1 10.5 oz can of Cream of Chicken Soup 1 8 oz Block of Cream Cheese 1 Chicken Bouillon Cube 1 32 oz bag of frozen diced hash browns 4 Cups of Shredded Cheddar Cheese (3 Cups in the soup & 1 cup for topping before eating) 1 9 oz bottle of Bacon Bits (Add ½ Cup real Bacon Bits in soup and ½ Cup for topping before eating) Salt and Pepper to taste. Cook on high for 3 ½ hours or until potatoes are tender. Set crock pot on high and add chicken broth. 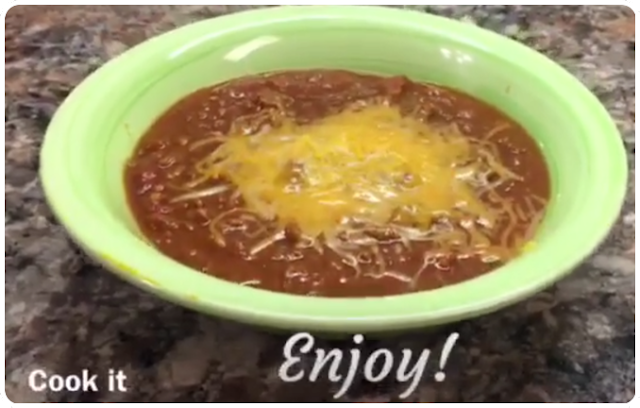 Blustery day and looking for something to warm you up or just have a busy day and need something you can put together quickly and not have to babysit too much, than this is the chili for you! Don't miss out, click below to grab this recipe! Set crock pot to high. Add hamburger to crock pot. 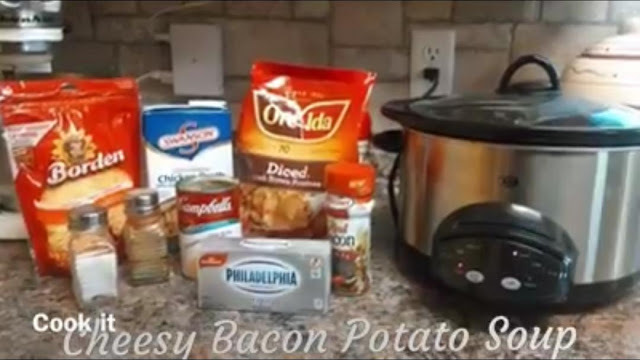 Chop onions and add to crock pot along with the next five ingredients. Stir well. Add chili powder and seasoning mix packages and stir until well combined. Cover and cook on high for 4-5 hours stirring occasionally. Salt and pepper to taste before serving. Top with shredded cheese, sour cream or your favorite toppings and enjoy!